Another recent study found that since Virginia Tech, 122 people have been killed and 198 have been injured in college campus shootings. 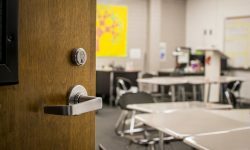 Some might argue print publications and news stations “stretch” the definition of a school shooting to create editorial pieces with shocking statistics. For instance, according to a recent op ed by James Alan Fox, the Lipman Professor of Criminology, Law and Public Policy at Northeastern University, Everytown for Gun Safety reported there have been 290 school shootings — including at technical schools and colleges — since Sandy Hook. However, Fox claims almost half of those school shootings were completed or attempted suicides, accidental discharges of a gun, or shootings with no injuries. And while those incidents deserve to be recognized as significant events, they likely don’t constitute what the average person thinks when they hear “school shooting”. Whichever way you slice it, gun violence on school and college campuses is still a real threat and something that every campus needs to be prepared for the possibility of. That’s why this fall, we touched on K-12 school shooting statistics. 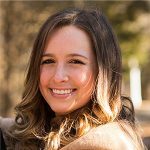 And now, in this article, we’re going to focus on college campus shooting statistics as recent studies actually show a significant increase in the number of shootings on or near college campuses in the last 50 years. 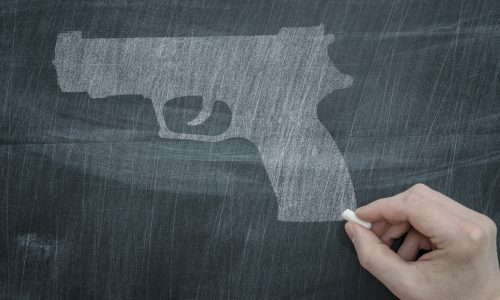 A 2016 study from the Citizens Crime Commission of New York City found in the previous five years alone, incidents of gun violence increased from 12 incidents during the 2010-2011 school year to almost 30 incidents during the 2015-2016 school year. 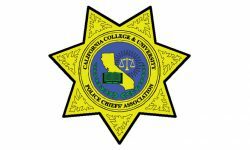 To conduct the study, the CCC looked at 190 incidents at 142 colleges from the 2001-2002 school year through the 2015-2016 school year in which at least one person was intentionally shot (not including the shooter) on two- or four-year college campuses, or incidents that occurred within two miles of a college campus and involved at least one student victim. 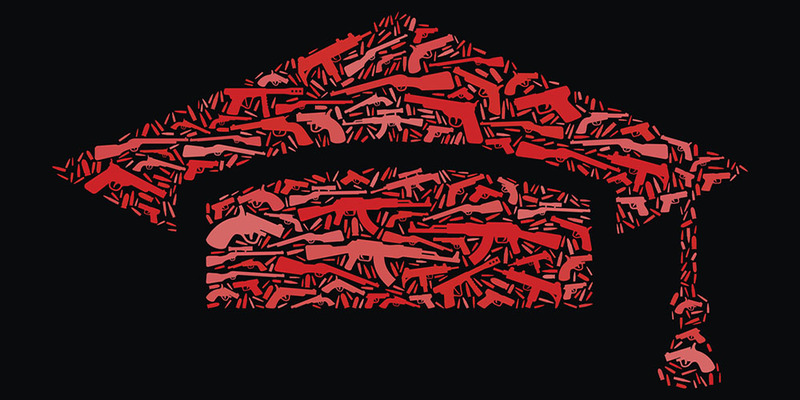 Out of these 190 incidents, 437 people were shot, 167 were killed and 270 were wounded. 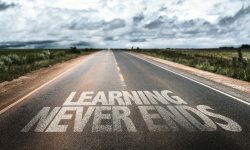 And, while examining the changes in frequency over time, the study found casualties during the last five school years represented a 241 percent increase compared to casualties during the 2001-2002 to 2005-2006 school years. View this article’s slideshow to see the study’s breakdown of each college shooting from Aug. 2001 through Aug. 2016. 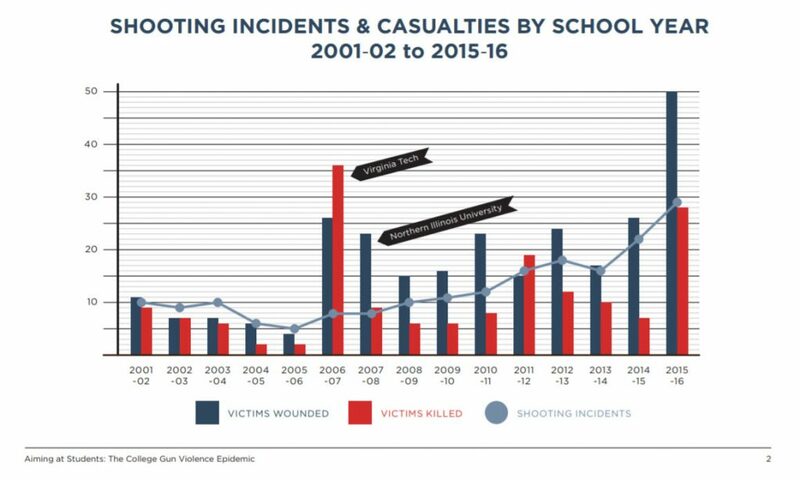 Below is a chart, also from the study, breaking down shooting incidents by school year, victims wounded and victims killed. 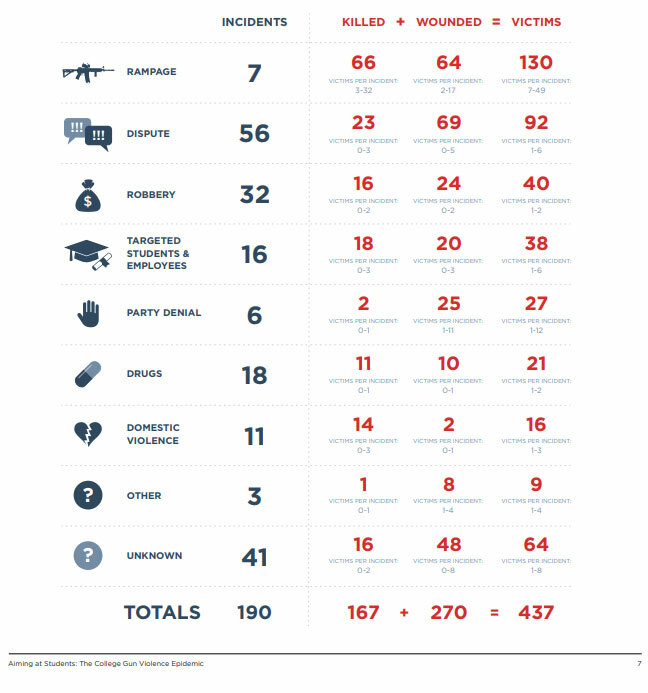 Below is a chart from the study showing a complete breakdown of the type of incident and the number of people killed or wounded. Who Are the Victims and Perpetrators of College Shootings? Where Are College Shootings Most Prevalent? 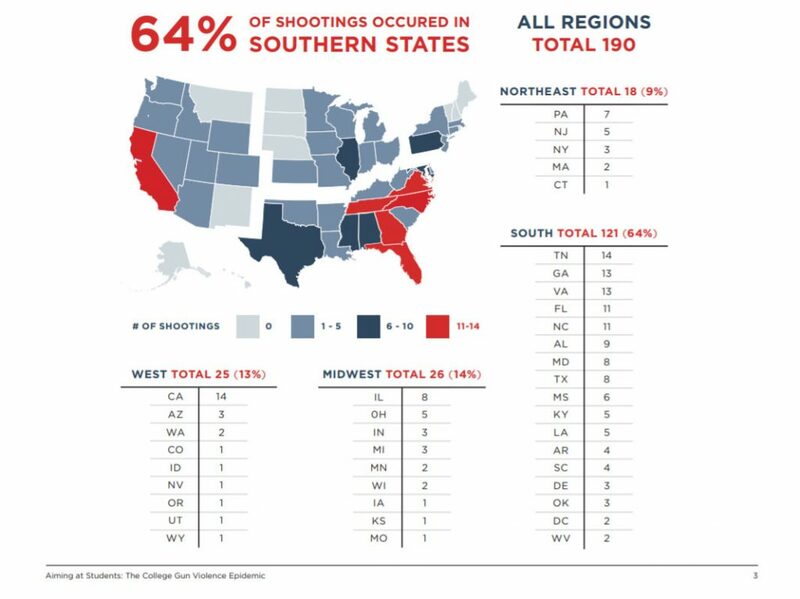 Furthermore, the Commission’s study breaks down the shootings by region and state. Twelve states experienced more than five shootings, accounting for 64 percent of the incidents. Below is a complete chart of the breakdown by state and region.